My name is Jeanette Fortune and I am a proud employee of American Airlines/Premium Services/headquarters, which I have served as a customer service representative for eight years. I have had the opportunity to assist in many charitable events, but this ranks high above the others. My grandson, Sekou Brown, eight -years-old from Oklahoma City joined me in Dallas on our journey to Orlando for this wonderful event. I tried to prepare him for what to expect beforehand, but how do you explain to an 8-year-old what to expect when you are not sure yourself? So I just told him to be on his best behavior. It comes natural to him to have fun and share the love in his heart and he did just that. 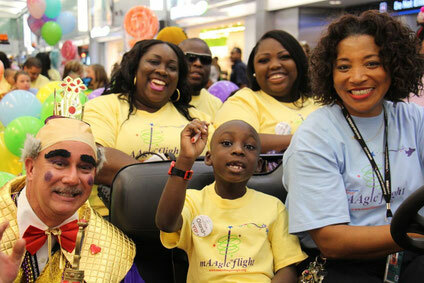 He gave all the kids and family members a big high five when they deplaned with this enormous smile on his face as he held a sign that said, "Welcome to Disneyworld." The sign was made by other 3rd graders from elementary schools in Arlington, TX. I believe seeing another child somehow made a difference on the recipients. Sekou told me later, this was "fun'er" than going to Chuckie Cheese - his favorite place in the world. Before the families got to Orlando, we had decorated the Orlando American AirlinesTerminal with balloons, signs, streamers, large lollipop stands and colored CandyLand footblocks. 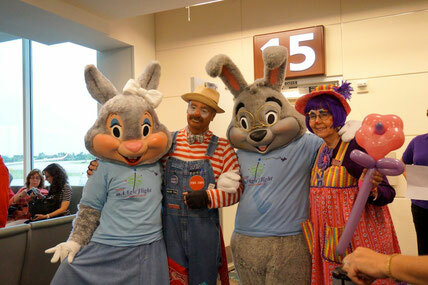 Prissy and John-John, the clowns, were a special treat for the kids and others that passed through the airport. One of the clowns showed Sekou how to make balloon characters for everyone. Sekou said this was going to be his newfound career on the side. 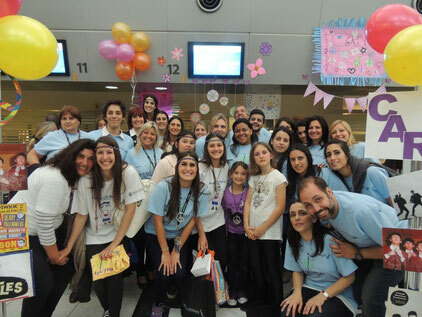 To share in others' lives, to bring the joy and excitement we saw on the kids, their family members, the volunteers and those in the airport faces, made me know that this was Something mAAgic for us all. Thank you for allowing us the opportunity to be a small part of something big as this. We look forward to volunteering again and again! ~Jeanette Fortune-Orlando arrivals Straight from the HeAArt !! It was my first time as a volunteer. It was so much fun. It was like being behind the scenes at Disney World and making dreams come true. I suggest if you haven't volunteered, you should consider it. The smiles on the children's faces is what made it all worth it. This is the event for me ... this is American Airlines and what we do best - all of the time. It's difficult to say a "few" words when one has such a humbling experience such as this. Each year is just a little different because we do everything better each time. It's kind of hard to determine if this event made American Airlines or American Airlines made this event, but for sure we hold the hearts of countless little (and big) dreamers squarely in the palm of our hands. I say this, anyone who participates just once in this great event will forever be tied to it because the "families" we touch will forever be ours and thus help us to push our personal difficulties aside and make our own personal lives even more meaningful. You know, I've never seen some of our crew members do dance steps as they did coming off the aircraft.....they could rival James Brown! See ya next year!!! This was our first year to volunteer and despite all of the time we spent in the airport trying to get to Orlando and home, James asked me if we were going to do this again next year. Saturday evening he told me, "I really want to come back next year and would like to bring Jordan (his cousin). I want her to see how good we have it and how lucky we are." He made me very proud! I lost my mother three years ago to colon cancer. Before she got too sick to travel, my aunts made one of her wishes come true. They took her on an airplane for the first time and they flew to Las Vegas. I will never forget what this did for her, and she was an adult. I told my aunts that this event was my way of "paying it forward." I hope that my contribution has made these children as happy as the wish that was given to my mother. I dedicated my time this year to my mother, Norma Sue Burd! I've wanted to participate in this event for years but for various reasons never did. This year, all the flights to Orlando were completely booked but I had told myself that no matter what it took, I was going to participate! The day prior to the event I helped in an all-night software implementation, went home, got a few hours of sleep, and hit the road late that afternoon - yes, I drove from Dallas/Fort Worth to Orlando. I arrived midday on Friday and went straight to the airport to help decorate the gate areas and greet the kids on the incoming flights. I also volunteered at GKTW on Saturday morning and evening. Needless to say, I was exhausted from work and the drive down, but that was nothing compared to what these children were dealing with. That knowledge made it easy to get my 2nd wind and give whatever help I could to make even just a few days brighter for these special kids. I plan to participate next year and would do the same all over again. The reason I volunteer is because I feel we all should give back, and this is such a wonderful event. 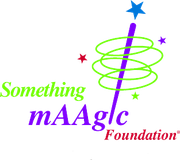 I feel I should be thanking the families and GKTW Village for allowing me to be a part of this event - just being able to bring a smile to the faces of the families and to know you make a difference in their lives no matter how small. This alone will keep me coming back for years to come. This experience has enriched my life more than words can ever describe, and I am truly grateful and thankful for it. I went for the first time last year and I was hooked. It was great to work with energetic excited people around the company who volunteer their own time and resources to help. The smiles from the kids make the whole trip worth it!